After years of discussion by the Legislature and civic leaders seeking more authority to make much-needed investments in local infrastructure and economic development projects, Gov. Brown handed California communities a robust new financing tool today when he signed SB 628, a bill that will dramatically expand the authority of an existing investment mechanism known as Infrastructure Financing Districts. The California Economic Summit has supported these proposals since they first appeared in 2013 and made their way into the governor’s January budget proposal—creating a guide that shows how “enhanced” infrastructure financing districts (EIFDs) could help local leaders make investments in everything from aging water mains and crumbling local roads to sidewalk repairs and next-generation transit stations. A group of more than two dozen Summit leaders have worked with lawmakers and the administration this year to ensure the final legislation will allow local governments to tap into the full complement of public and private investing tools (including the tax increment financing mechanisms they had under redevelopment), that it will increase the types of infrastructure EIFDs can support (water facilities, for example), and that it will be flexible enough for the new districts to be created across city and other local agency boundaries. This new local financing authority certainly isn’t arriving a moment too soon. With ninety-year-old water mains bursting in the state’s biggest city, dams cracking in the Sierra foothills, and nearly 60 percent of local streets in cities like San Jose now in “poor” condition, the state auditor has put California’s long-neglected infrastructure in the same “high-risk” category as the state’s pension and health care systems. The City of Los Angeles alone, for example, is estimated to have a backlog of $8.1 billion in deferred infrastructure maintenance—a figure as large as the city’s entire annual budget. Sen. Beall has said he wants to continue broadening public participation in the project development process, and he has committed to introducing another bill next year that will aim to ensure these new financing districts don’t cause gentrification and displacement—a concern expressed by some housing advocates and an effort the Summit also supports. The Summit will also be hosting several convenings in Northern and Southern California this fall with public agencies and private investors to begin creating a pipeline of projects that could benefit from creating an EIFD. 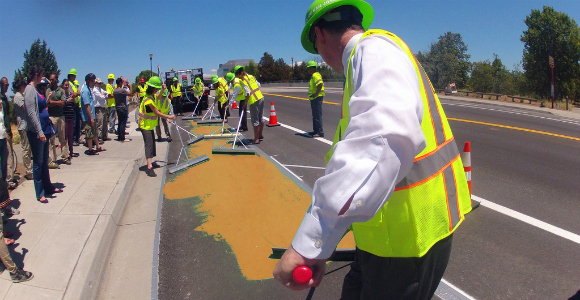 With the governor’s signature, the next step is clear: No matter what type of infrastructure a public agency needs—from upgrading sidewalks to developing next-generation transit and stormwater collection facilities—it is time to start building.